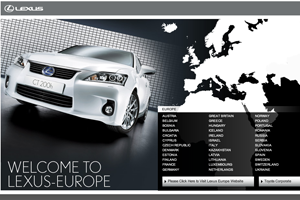 Lexus Europe has appointed Deeper Blue as the lead agency for its next pan-European retailer training programme. The events will educate around 1,000 customer-facing managers and staff about the new generation Lexus GS, which was unveiled at the 2011 Frankfurt Motor Show in September. It will feature plenary meetings, training and dynamic driving of the new GS and its nearest competitors. The three-week event, which will take place in Southern Europe in early 2012, will be Deeper Blue’s first major project for the company. Lexus Academy Europe head Olivier Naus said: "Deeper Blue captured the essence of the Lexus brand and will translate this into a truly engaging experience for our key audiences. We’re excited by Deeper Blue’s fresh approach to our pan-European training event strategy." The agency won the business after a competitive pitch, having run a smaller event to help launch the CT 200h hybrid compact car to European management staff in Brussels in 2010. "Lexus is an inspirational brand to be working with," said Laurence Croneen, founding director of Deeper Blue. "It’s a very important win for Deeper Blue." Deeper Blue will deliver the event with driving event specialists Powertrain International, and training experts Accelerated Training Resources.